Explain how good product selection helps salespeople create viable quotes. Describe the three main ways Salesforce CPQ facilitates product selection. 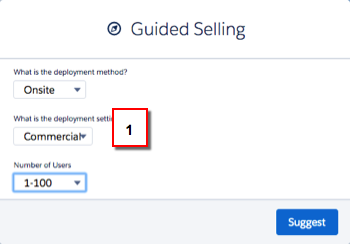 Describe the user experience when using guided selling. Define important qualities of a bundle. When you put together a quote, you’re working out what Infinity Solutions is selling and at what price. What you’re selling depends on what your customer is asking for. Although this process seems straightforward, there are some potential complications. For example, what if you don’t know which products best meet your customer’s requirements? Or, what if some products have to be combined with other products to function properly? If you create a quote that isn’t technically viable, you have an unhappy customer, you’re frustrated, and the sales process is delayed. Salesforce CPQ simplifies product selection so you create quotes correctly the first time. As you’ll see, it does this in a variety of ways. After you create a quote, you add products. Salesforce CPQ makes it easy. You click Add Products to display a list of active products, and you simply check which products you want to include on the quote . This list of products updates whenever new products are created or old products are retired. Customizable filters help you find the products you’re looking for. Your Salesforce admin can group products into categories, such as Product Family, for even easier product selection. Sometimes your customers don’t know which products they want to buy. They know their business requirements, but not the specific products that meet those needs. Sometimes you don’t know what products are best either. Salesforce CPQ can help by leading you through a guided selling process. When you answer a series of questions , you get a list of suggested products that fit the bill. The guided selling process begins when you start adding products to a quote. Your answers to the guide questions determine which products Salesforce CPQ suggests. Sometimes your answers prompt Salesforce CPQ to ask you follow-up questions. You get a dynamic, responsive experience with each quote you create, and you easily find the products that best meet your customers’ needs. Sometimes you have to sell products as a package because the component products depend on each other. With Salesforce CPQ, your Salesforce admin can group products in a set and enforce rules to ensure the set is complete and accurate. These sets are called bundles. You configure a bundle by choosing a product that’s associated with other products. You see an easy-to-use interface that presents related products that are part of the bundle . Not only does this simplify your product selection, it reminds you and your sales team to discuss potential up-sells or future optional purchases. You can’t select invalid combinations of products when you configure a bundle. Salesforce CPQ enforces your business logic so that you only present the customer with a technically viable quote. This means fewer errors and less work for you. Bundles, guided selling, and a simple product selection page help you and your sales team assemble quotes quickly and accurately and minimize the likelihood that quotes will be rejected or products returned. The sales reps at Infinity Solutions can focus their energy on the next sale instead of wasting time fixing the last.